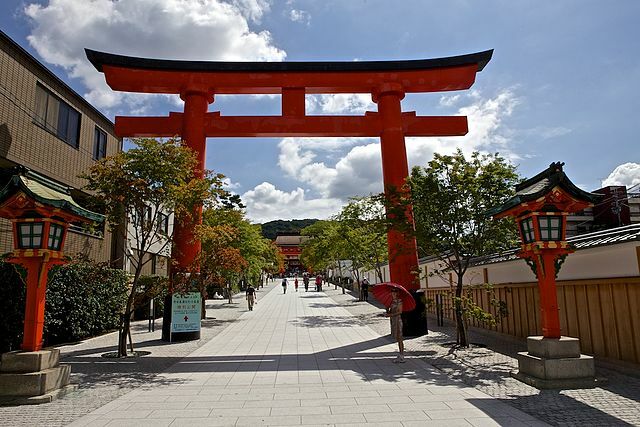 One of Kyoto's often-overlooked jewels, located just south of Higashiyama in the Fushimi area is Fushimi Inari Shrine. ​Dedicated to Inari, the Japanese fox goddess, Fushimi Inari Taisha, which is believed to have been built at the beginning of the Nara period "710–794", is the head shrine for 40,000 Inari shrines across Japan. The shrine sits at the base of a mountain also named Inari and stretching 230 meters up the hill behind it are hundreds of bright red Torii "Gates". Countless stone foxes are also dotted along the path. It includes trails to many smaller shrines which span 4 kilometers and takes approximately 3 hours to walk up. At the very back of the shrine's main grounds is the entrance to the torii covered hiking trail, which starts with two dense, parallel rows of gates, called Senbon Torii "thousands of torii". 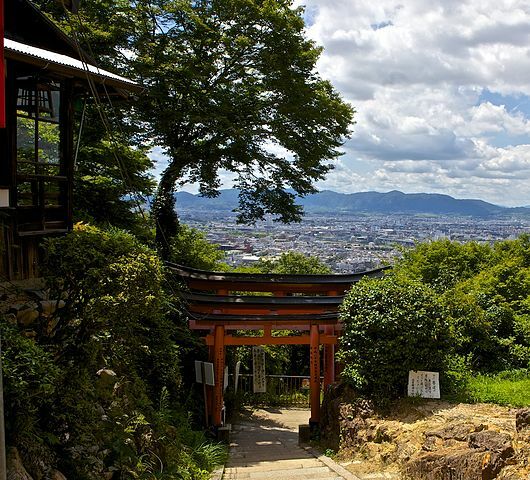 A visitor could easily spend several hours walking up the hillside, taking in the beautiful views of the city of Kyoto and walking through the torii, which appear luminescent in the late afternoon sun. 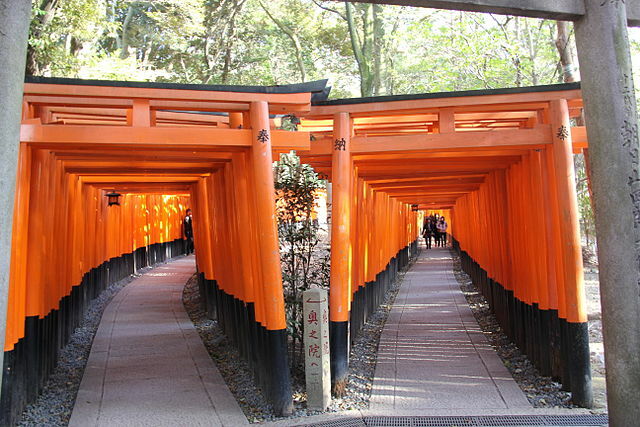 Fushimi Inari Shrine’s long tunnels of vermilion torii gates are the main attraction for overseas tourists, many of whom see them as typically Japanese. ​The shrine’s free admission with no closing day, and the chance to enjoy hiking also have contributed to its popularity. It is the most popular destination for the first shrine visit of the year in the Kansai area, attracting about 3 million pilgrims annually. 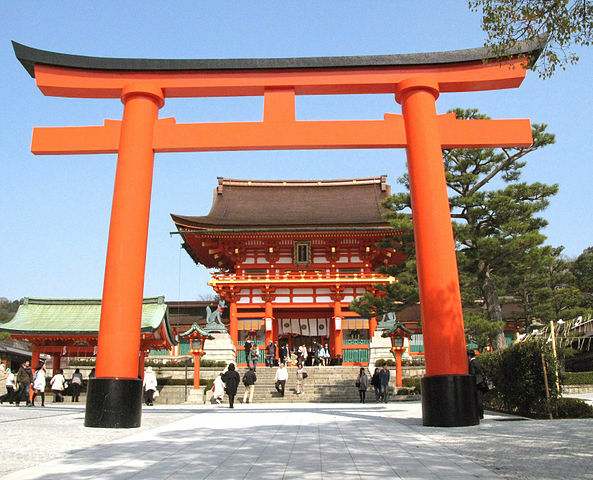 Foreign visitors to Japan ranked Fushimi Inari Shrine as their favorite tourist destination in 2014. The Hiroshima Peace Memorial Museum was second on the TripAdvisor list, followed by nearby Itsukushima Shrine in third; while the temples of Kinkakuji in Kyoto and Todaiji in Nara placed fourth and fifth. Take JR Nara Line from Kyoto Station to Inari Station "takes 5 minutes". The Shrine is about 5 minutes’ walk from the station.